Often social media campaigns simply consists of a Twitter feed, blog, Facebook page and YouTube channel. And for many companies that is the most appropriate, cost effective and manageable strategy to use. But every now and then a company will introduce a little sprinkle of social media fairy dust to add a magical element to their campaign…below is a look of some of my recent favourites…. Jimmy Choo recently used Foursquare to launch a real-time treasure hunt around London. 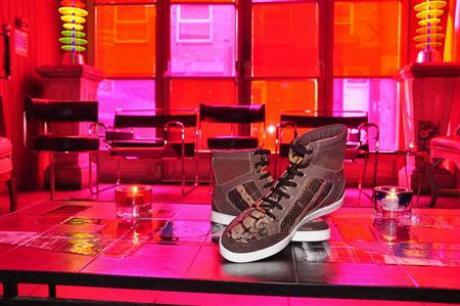 A pair of Jimmy Choo trainers were placed at fashionable hangouts, marked up on Foursquare, for one lucky winner to claim. The crisp brand heralded as ‘good for sharing’ has launched a website for people to out their over sharing friends. Users are encouraged to name and shame friends who post boring status updates or Tweets – hoping instead to encourage people share things that are ‘really worth sharing, like Pringles’. The campaign demonstrates integrated messaging and clever tie-in with the ‘sharing’ theme. It is also wonderfully satirises one of the common complaints about social networking, promoting over-sharing by sharing the banal comments more widely – brilliant! Integration across different social media channels is also very effective, with a bespoke website dedicated to the campaign, ‘oversharers’ tweets retweeted on a Twitter feed and an ‘overshare’ button on Facebook. The Royal Shakespeare company used the power of Twitter to try and make Shakespeare accessible to the digital generation. What followed was a re-enactment of Romeo and Juliet, through the medium of Twitter (Juliet had over 5,000 followers). The campaign brilliantly updated a classic and kept many gripped for the duration of the month long storytelling. The real-time nature of Twitter meant that it was sometimes hard to keep up, but a bespoke website provided a timeline of events for those that missed out. An oldie but a goodie…and not a pure 100% social media campaign, but the Liverpool Street life is for sharing advert perfectly married two phenomonons of the digital generation – flashmobs and social media. The advert was posted onto YouTube as soon as it was premiered on Channel 4, and has now received 2,693,903 views with the video quickly going viral online. This showed good integration of the marketing disciplines, which is exactly what is needed for an effective social media campaign, but I would suggest that perhaps more people were interested in the entertainment factor…than who the campaign was actually by. Do feel free to share any other examples of creative social media campaigns you have seen below! P.s. some of the above campaigns were kindly pointed out by my colleague Nicky Smith, who also blogs over at ‘Research in the News’ – go check it out for some interesting insight into the use of research in PR…. Love the idea of tweeting Shakespeare. I think R & J lends itself perfectly and, no, I don’t think the bard would be spinning in his grave – he was after all, of his time but for all time!